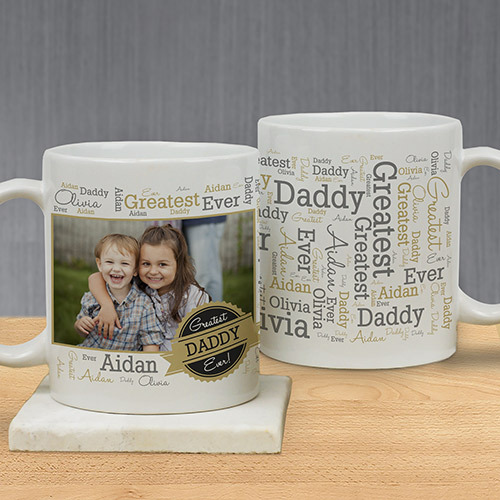 Give him the greatest gift ever, his children letting him know just how great he truly is with our Personalized Greatest Dad Photo Word-Art Mug. Personalize this Mug with any photo, title and all the words that describe him best. Make a great gift for anyone special in your life, whether that be Dad, Grandpas or Uncles. My husband loved it. Good quality mug. nice and clear print. Same as you see from the website. Additional Details Looking for other gifts for the kitchen and cooking and decor? Check out a personalized house warming gift from GiftsForYouNow!